With this dairy free & soy free diet that I'm on (for another 4 more weeks! 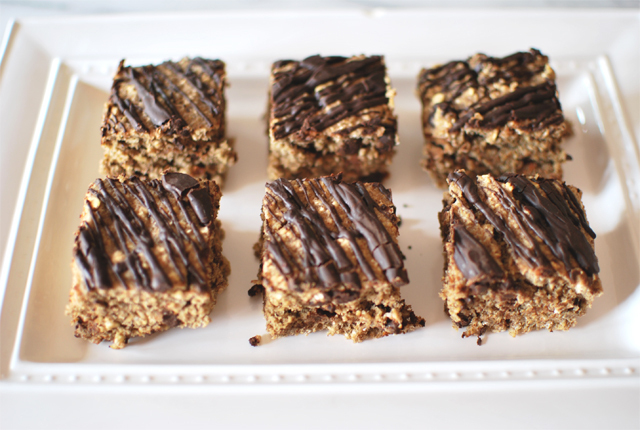 ), I've been scouring the internet for yummy baked goods. I found this recipe while pin'ing one day and I am totally addicted. 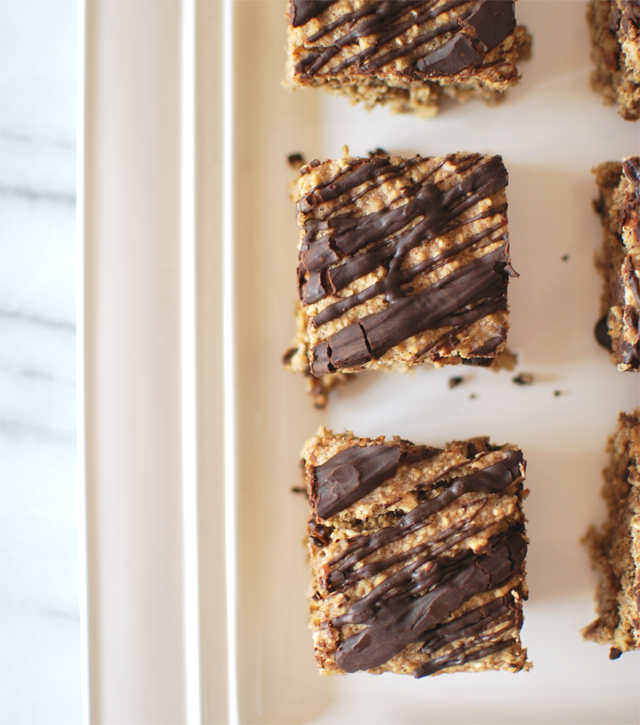 As Monique says, these are great as a quick snack for on-the-go or just plain dessert. Just as they're titled, I've been eating them as breakfast bars and I find myself not getting hungry as quickly then when I have cereal or toast with peanut butter in the morning. Granted, it's probably because I eat so many of them at once! I know you guys will enjoy these too! TGIF! - Preheat oven to 350 degrees F. Spray 9x9 inch baking pan with nonstick cooking spray. - To make oat flour: Place oats into blender or food processor and blend for 1-2 minutes until oatmeal resembles flour. You may need to stop blender and stir oats a couple of times to ensure that all oats have been blended. - Transfer oat flour to a medium bowl; whisk in baking powder, baking soda, salt and cinnamon; set aside. - Place bananas, vanilla, applesauce, and honey into blender; blend 1-2 minutes or until smooth and creamy. Add to oat flour mixture and mix until just combined. - Bake for 15 minutes or until knife inserted into center comes out clean or with just a few crumbs attached. - Cool 10-15 minutes on wire rack. - Prepare drizzle by adding 2 tablespoons of chocolate chips and coconut oil in microwave safe bowl. - Microwave on high 30 seconds; stir well to combine then drizzle over the top of bars. 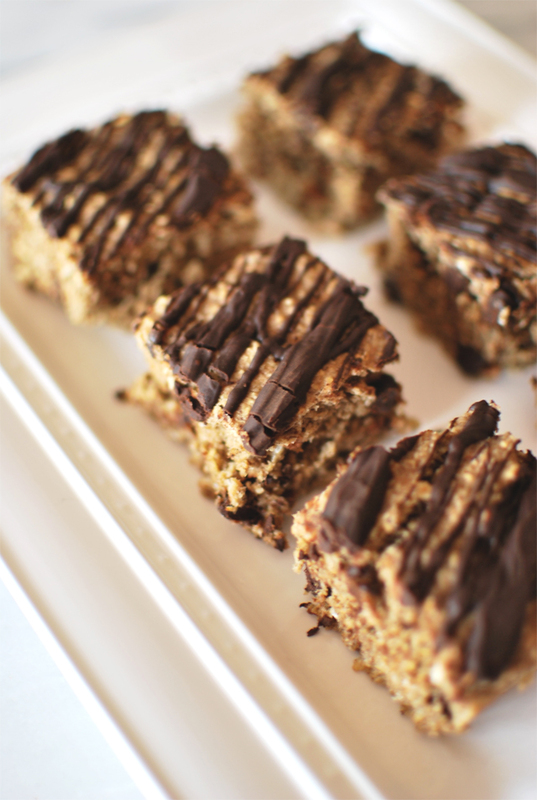 - Cut bars into 16 squares and enjoy!